Bread pudding with bourbon sauce is a great weekend dessert. Prepare on Saturday, then bake on Sunday. 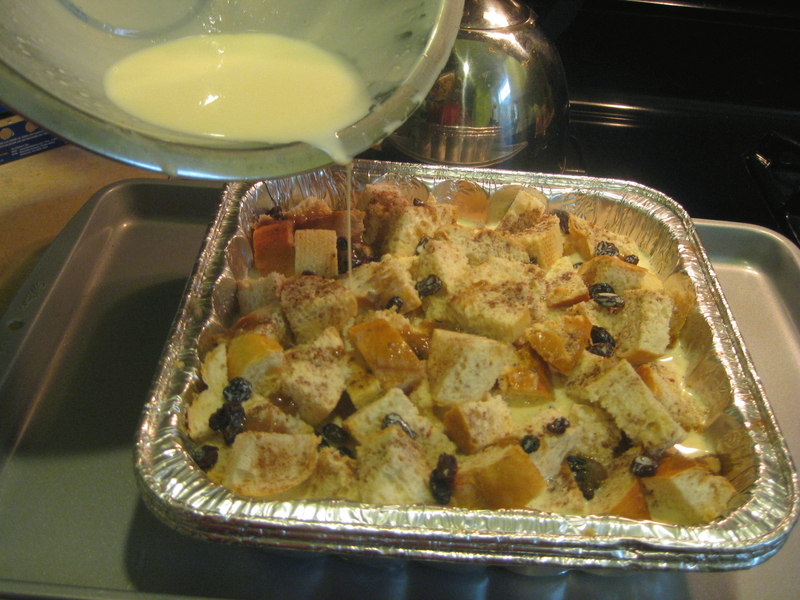 This recipe is a twist on my Creole bread pudding. Easy and delicious. And the bourbon sauce will impress all of your guests. Header image is by David Monniaux and used via a Creative Commons license. 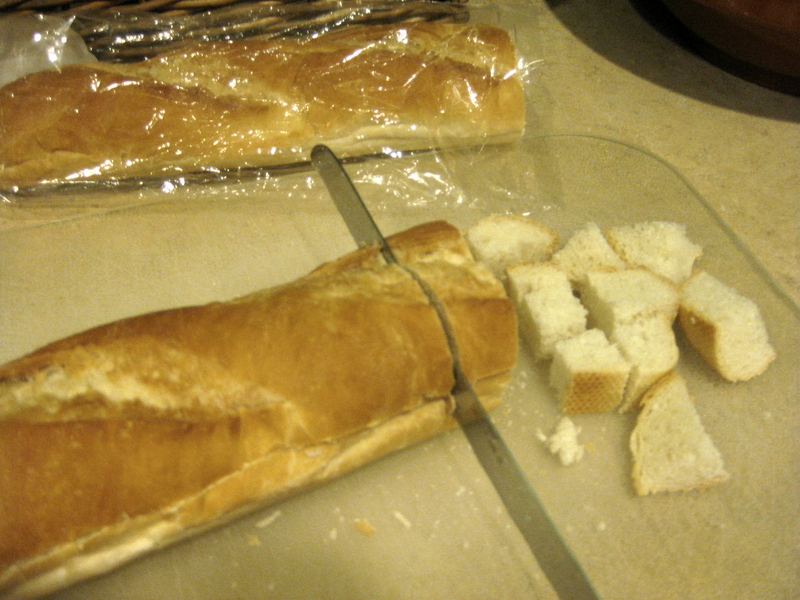 Cut bread into 1-inch-thick slices. You can cube them or leave them as slices. I have done both, but I think I like the cube presentation, although the slices are more old school. Combine raisins, 1/4 cup of brown sugar (for sprinkling) and cinnamon in a separate bowl. 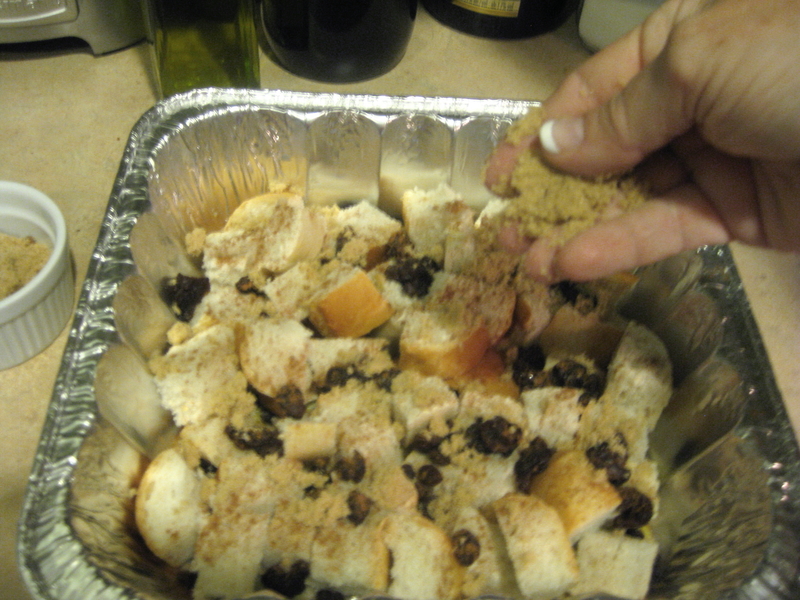 Add melted butter and about a third of your raisin mix into the baking dish. Arrange half of the bread into buttered baking dish. 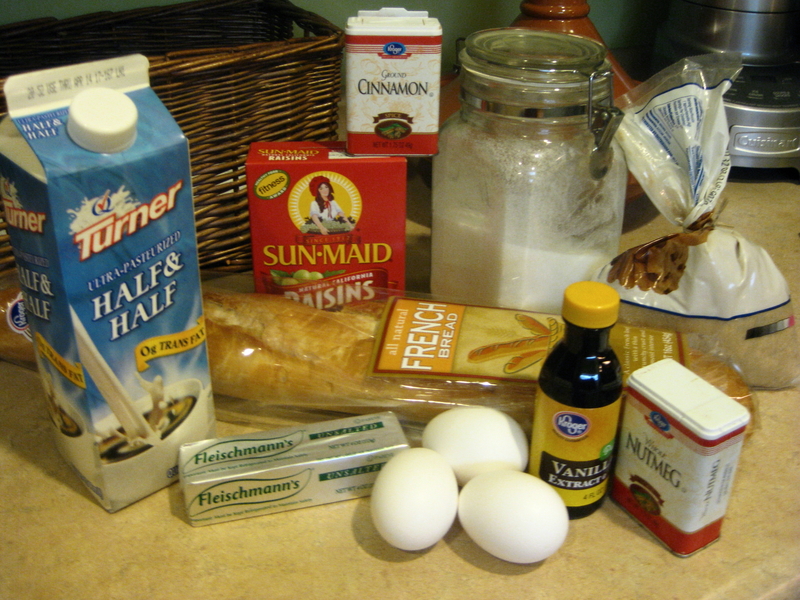 Sprinkle with another third of the raisin mixture. Add rest of bread and repeat with another raisin/sugar/cinnamon sprinkling. 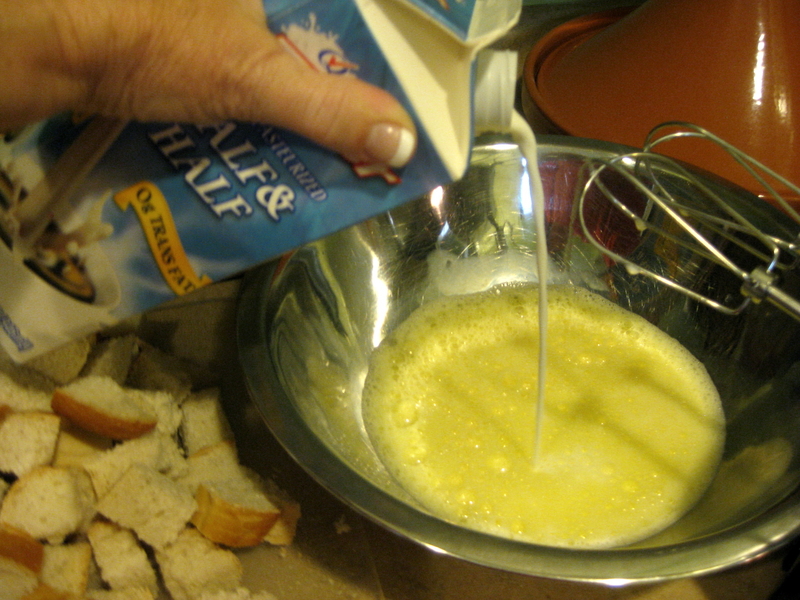 In large bowl, add eggs and beat with hand mixer until they are light and creamy. Add regular and brown sugar. Beat well. Add half and half. Mix well. 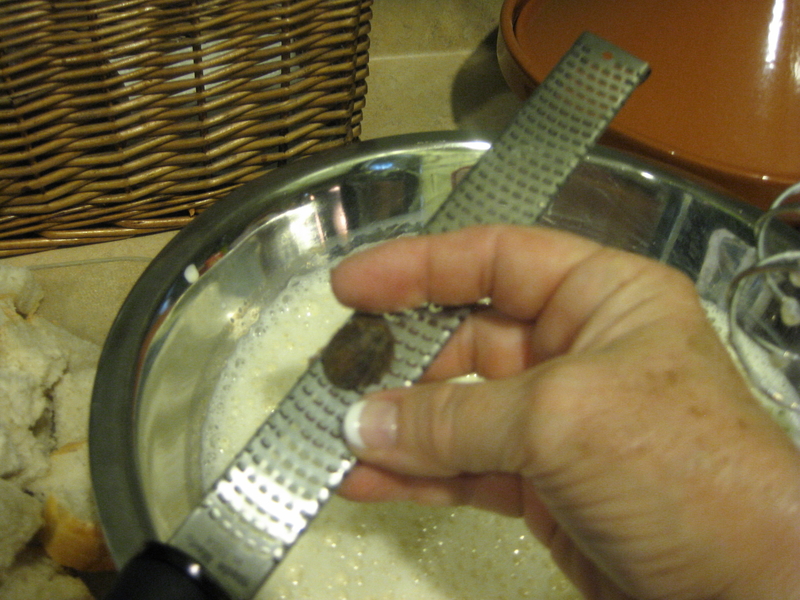 Stir in vanilla and nutmeg (microplane, if you grate your own). Scrape, mix about a minute more. Pour mixture over bread in pan. Let stand at least an hour. 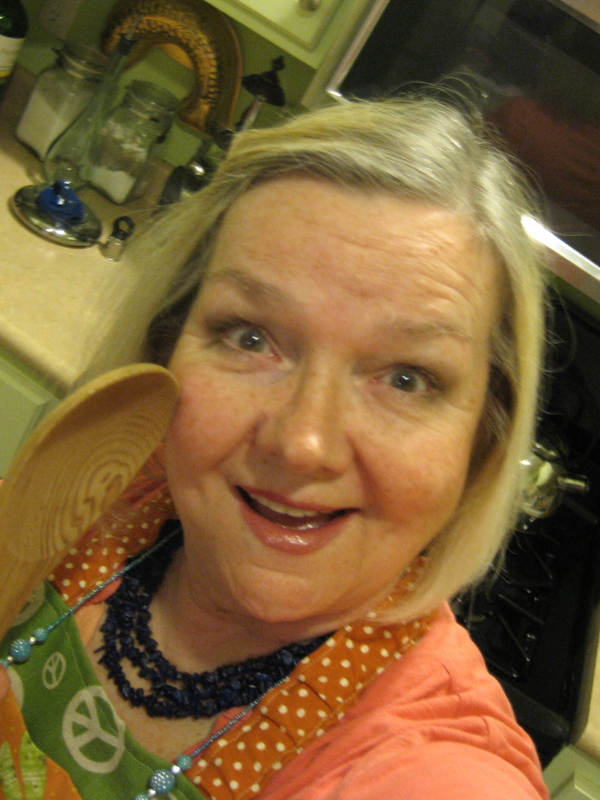 With rubber spatula, press bread down to make sure it’s fully soaked up liquid. If you’re using the slice option, top slices can be turned over for greater absorption. If I can, I let it stand in refrigerator overnight covered with foil. Take bread pan out of fridge about 30 minutes before cooking to let it warm up a little. Preheat oven to 350 degrees. Boil some water on the stove or in microwave. Cover pan with foil, then place foil-covered pan in larger pan. I use a large baking sheet with sides up at least an inch. Open oven, place larger pan onto rack and then set baking pan onto it. Pour boiling water into the larger pan so that it comes up about half-way on the pudding pan. (IMPORTANT: Wait to pour water until pans are in oven. Otherwise, you’re likely to spill it on the way to the oven.) This hot water will create a more even, moist heating environment for the pudding. Bake for one hour. 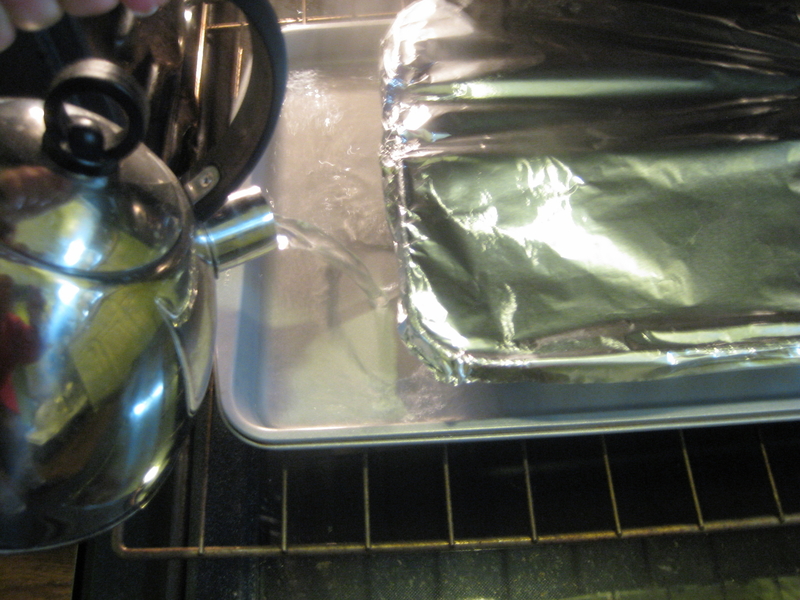 Remove foil and bake at least another 10 mins until top begins to look golden. If your pudding doesn’t brown sufficiently, put it under your broiler for a couple of minutes. Start cooking bourbon sauce now. 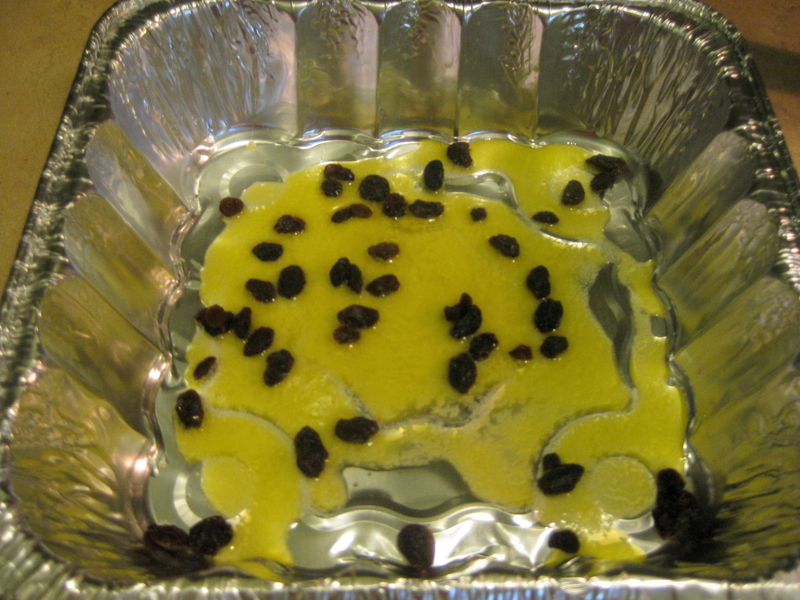 When pudding is done, remove from oven and let sit 10-15 minutes before serving. This stuff is hot! In medium bowl, mix 1 cup sugar and egg. It sounds weird, but the egg will infuse itself into the sugar for a wet mixture. Remember, sugar is almost always a wet ingredient for recipes. Return mixture 1-2 tablespoons at a time to saucepan. Stir on low heat until mixture thickens, about 2 minutes. DO NOT LET BOIL. Add bourbon, continue cooking until sugar dissolves. You can “feel” when this happens because sugar will be completely liquid not grainy. Mixture will thicken a little more. Stir constantly about 3 minutes. 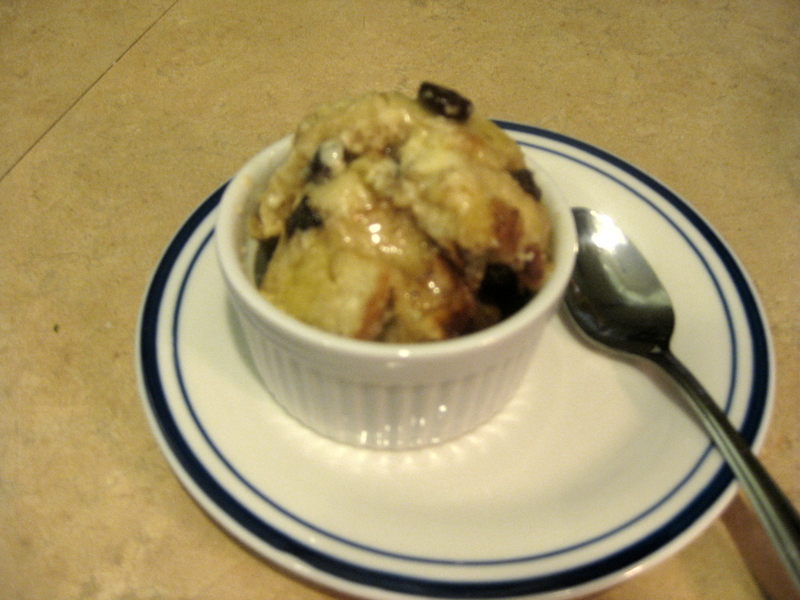 Drizzle over top of each serving of bread pudding. Sift confectioner’s sugar on top for pretty touch. SERVE: Plate or bowl, serve warm with bourbon sauce over the top. Pretty with a little sprinkle of confectioner’s sugar, too. THIS SOUNDS SO GOOD. 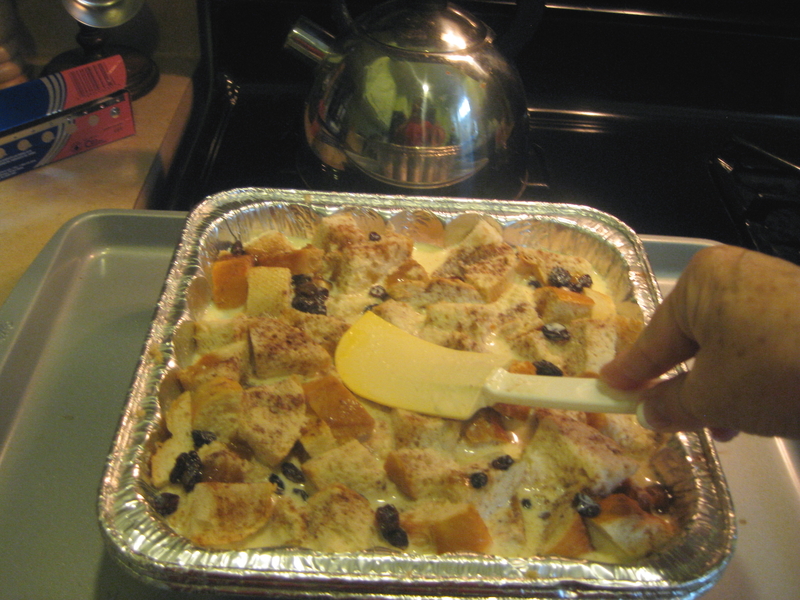 WILL TRY WHEN I GET ALL INGREDIANTS, BUT LOVE BREAD PUDDING, THANK YOU SO MUCH..
I’m making this bread pudding today. It’s in the oven and it smells delicious. My husband is a chocolate fan so I also mixed in about 1/2 cup of semisweet chocolate. Can’t wait to try the finished product.